Manchester Handyman offers services from replacing a tap to retiling and fitting a brand new kitchen. We can repair and replace cupboard doors, worktops, broken shelves in cupboards. We can plumb in a washing machine or dishwasher, fix a broken overflow in the sink or regrout all the tiles to give a fresh look. 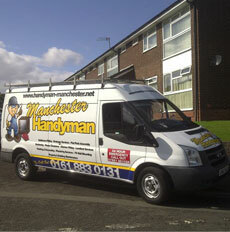 Whatever jobs you want doing in the kitchen the handyman manchester is here to help. We are happy to advise you when buying kitchen bases and cupboards and can tell you of a few places to pick up a bargain. We can supply and fit the cupboards and worktops or can wok just on a labour only basis where you provide all the materials. Whether you decide on full-fit or labour only you can rest in the knowledge that you will finish with a well-installed, professionally finished project together with an excellent and friendly kitchen fitting service. No matter how large or small the kitchen work you want doing our handyman is happy to come out and see you, talk it over with you and give you a fixed-fee quote. As well as the nice things like installing new cupboards and worktops, our handyman is also very useful when it comes to the not so nice stuff, leaking taps, burst pipes, blocked drains, flooded floors and damaged ceilings. We can quickly come in, tidy up and repair a kitchen letting you get back to normal everyday life. If you have a kitchen emergency and need some help, anywhere across the Manchester area including Crumpsall, Ashton and Worsley pick up the phone and give us a call, we’ll be there as soon as we can.